technique, and as a straight armbar. 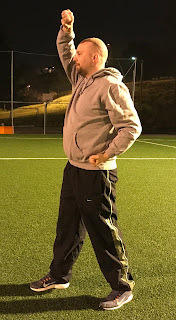 In Part 2 we looked at Momtong An Makki (often called inward middle section block) as a hyper extension of the elbow joint technique. 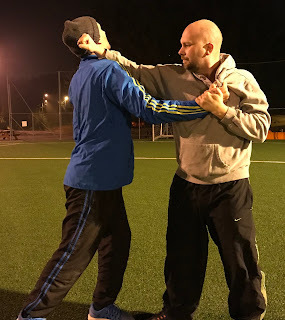 In this part we will be focusing on another common basic technique or gibon donjak; Eulgeul Makki or high section defensive technique and how to use it in a situation where the opponent is grabbing our lapel and against another kind of wrist grab. 1 basic template can have many different practical applications. A few years ago Rick Clark wrote a book with the title: 75 Down Blocks; Refining Karate Technique. In the book Rick Clark did a great job of taking the basic template apart and then applying it against a lot of different attacks and in subtle different ways. His book came up with 75 different applications to one single basic template; Arae Makki. The reason why he could get away with so many different ones is because he was looking only at the basic template or gibon dongjak. If he were to look at the dynamic context the technique in question is presented (the Poomsae, Kata, Hyung, Tul etc) he would be hard pressed to find more than a couple. The reason is that he would have had to look at the technique(s) before, the technique(s) after, the overall composition of the form etc. Looking at the movement in isolation however is easier, you get a lot more different applications which you then can go back and see where if any places in Poomsae can you see this example manifest itself. But enough talk for now it is more than enough to understand that a single technique can have many different applications, and that is something we have looked at all the way back to Part 1 of this series. Let us look at Eulgeul Makki as a wrist grab defense. Below you can see the solo template, divided into two parts, the prepetory and the execution. As a deflection you would minimize the movement as much as possible, take away the whole chamber and use body evasion along with the deflection, the other hand protecting the centerline or head. It fails to explain the whole movement. In Part 1 we looked at a wrist grab on the same side where the opponent grabbed your wrist when the hand was low. This time we will be looking at the wrist being grabbed while the hand is high(ish). The low wrist grab manifests itself during grappling to remove gips, especially if you grab the groin of the opponent. 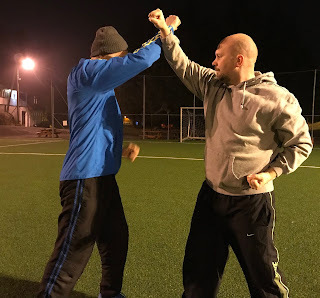 The higher wrist grab also manifests itself in close quarters, especially if you grab the throat, stick (a) finger(s) in the eye(s) of the opponent, grab an ear etc. If your hand is grabbed you need to free it to get that weapon of yours back online. This is one reason why we see the technique in Poomsae. Below you can see the wrist has been grabbed. 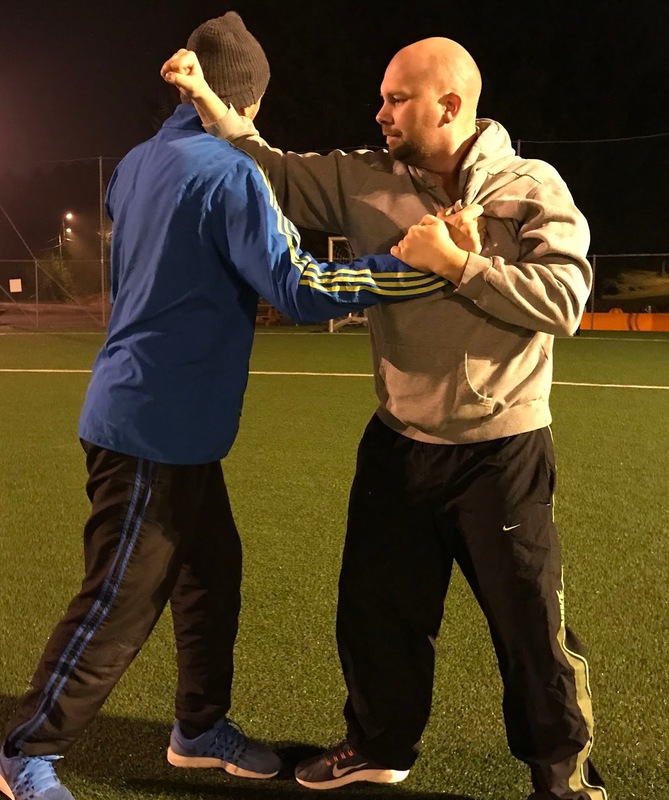 The context can be like I said above, but for the ABC's of Practical Poomsae Application, a simple wrist grab is a great starting point. Putting it all together and contextualize it comes later in my opinion, along with learning the Poomsae indepth. The prepetory movement of the Eulgeul Makki can be seen already. Below you can see that the hand that is grabbed is twisted and pulled sharply back to the hip while the other arms comes upward striking the opponents arm and stripping the grip. The whole application is fully dependant on solid traditional basic technique, any part of the basic technique is not done, then it will not work optimally. In the next part we will be looking at the technique from a lapel grab, but we will be covering two different variations. 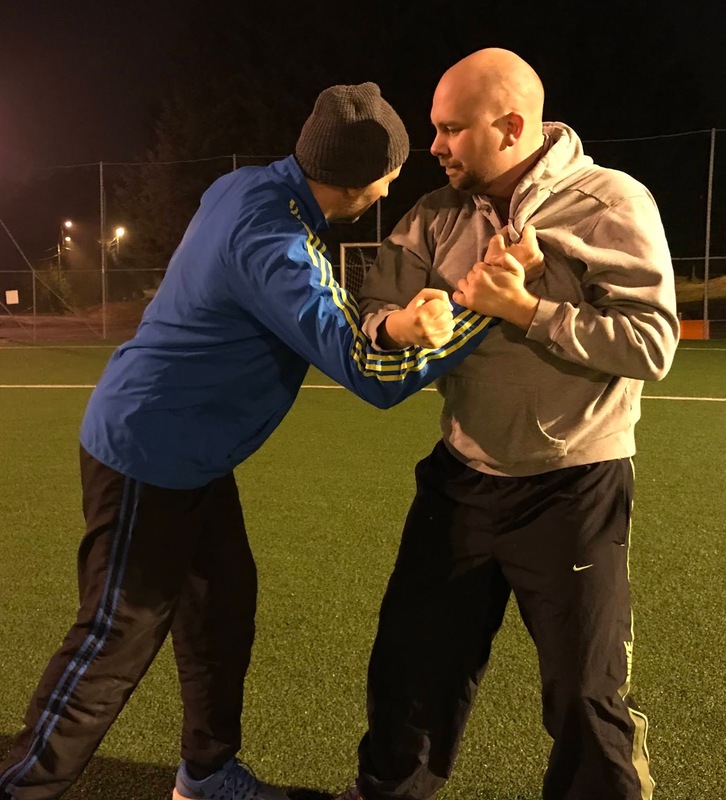 This demonstrates hopefully that one technique can have different applications, against different attacks or problem solving abilities, and within that, that there is also variations within the same application. 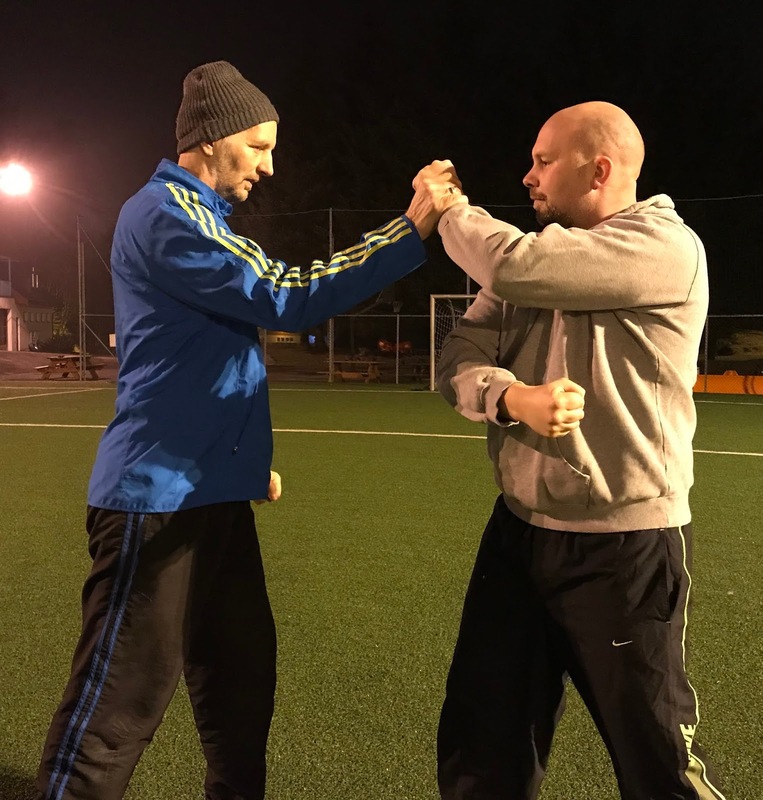 Again looking at the technique in isolation will give you great variation, while looking within the framework of Poomsae forces you to make a decision as to what fits that special unique context and framework. Below you will see that the opponent has grabbed my lapel. I slam my forearm down on his arm while securing that arm with my other hand. This is the prepetary movement of the solo template. This is something that the Poomsae exploits in a lot of different ways, and we will actually revisit this using a very different technique later in this series, but for now look below to see how you can follow up from the above picture. From the previous position we imidiatly strike upwards with our forearm into the side of his neck or jaw. This can be followed up agian in a number of different ways and I encourage you to play around with this and to look at how this relates bac to Poomsae. 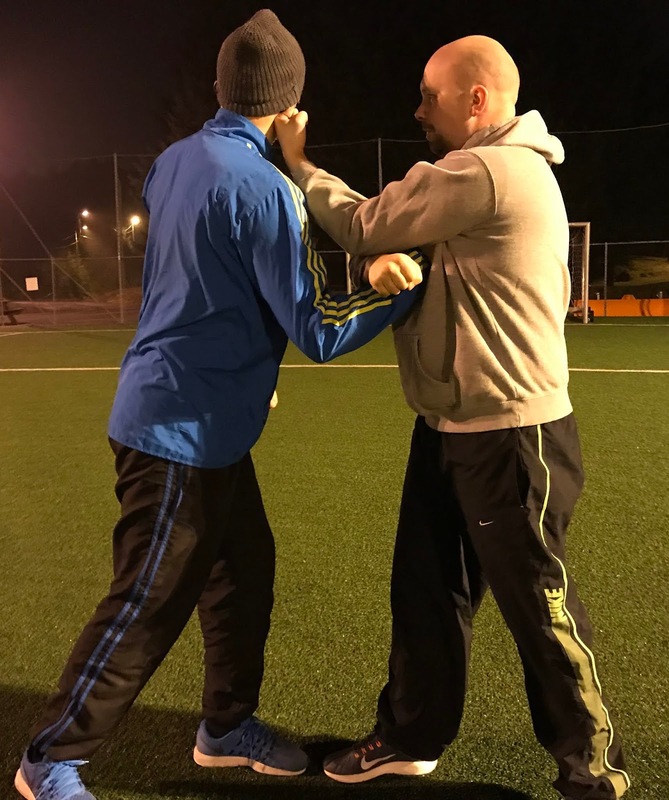 Here instead of securing his arm while striking down on his forearm you instead use that arm to deliver an upwards punch. Once you have punched it is pulled back to your hip while securing his arm on the way back, getting us a clear shot with our forearm for another strike. So in a split second you can deliver more strikes. Some people like the top one better because it is a little more simpler and you can focus more power into the finishing forearm strike, but it is a little slower. The second variation lets you go on the offensive from the get go, but it is a little weaker in terms of pure power (my opinion). Play with both variations and see what you like best yourself. Below you can see a real life example of a forearm strike to the side of the jaw/neck area. In this specific case you will only see the forearm strike in itself, it would have been more potent if he were to pull the opponent into the strike like we have done here, but the situation it is used in is different, he uses the strike as a preemptive strike, while in this article we have been using it as a defense against a lapel grab. I share the clip here so you can see (and appreciate) that this stuff works, and that you can see the effects without actually using it. In the next part we will be looking at the spear hand thrust :-) Stay tuned. A Discussion on "Chumbi Seogi/Ready Stance"
What was old hard style TKD like?